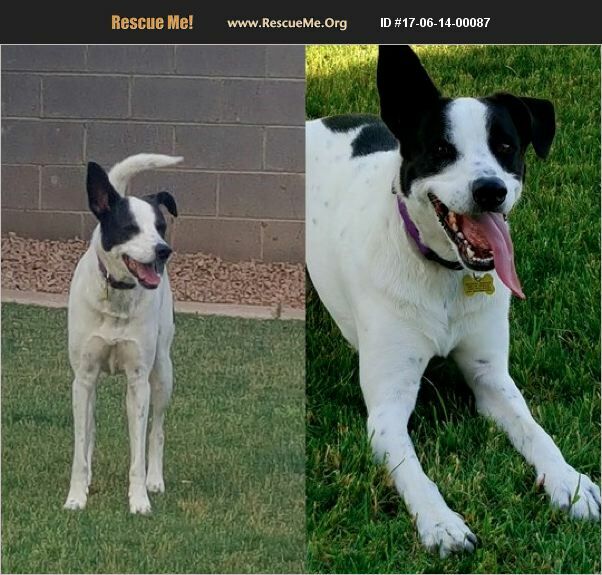 Arizona Border Collie Rescue View other Border Collies for adoption. Hi, my name is Jaxon and I'm almost 4 years old. I'm a sweet and goofy guy looking for my furever family! I dream of a family who loves my silliness and my boundless energy. I'm still learning my manners, but I can sit, lay down, shake your hand and roll over. I love to cuddle, but they tell me I'm not a lap dog mainly because I'm all legs! And boy, do I know how to use them! I run like lightening and love to play chase with other dogs and tennis balls. I'm quick and can jump and turn on a dime. I would love a family that has a big yard or likes to go to the dog park.I do like to go on long walks and do not pull as much as I used to. I am potty trained and know how to use a dog door. I do get a bit scared around strangers and will bark when they ring the door bell, so an understanding family who will introduce me to new people and fur friends slowly and patiently would be the best fit for me. Loud noises like fireworks and screaming kids tend to make me nervous and I want to run and hide. I also get scared when I'm left alone and cry a bit at first, but I am crate trained, so at the end of the day, that's where you'll find me, all cuddled up in a little ball in my crate with my favorite blankie, sound asleep dreaming about a family I can call my own.